Southern Matriarch: Children's Corner "Lillian"
Someone is growing into quite the young lady. It was time to try a more grown up dress. 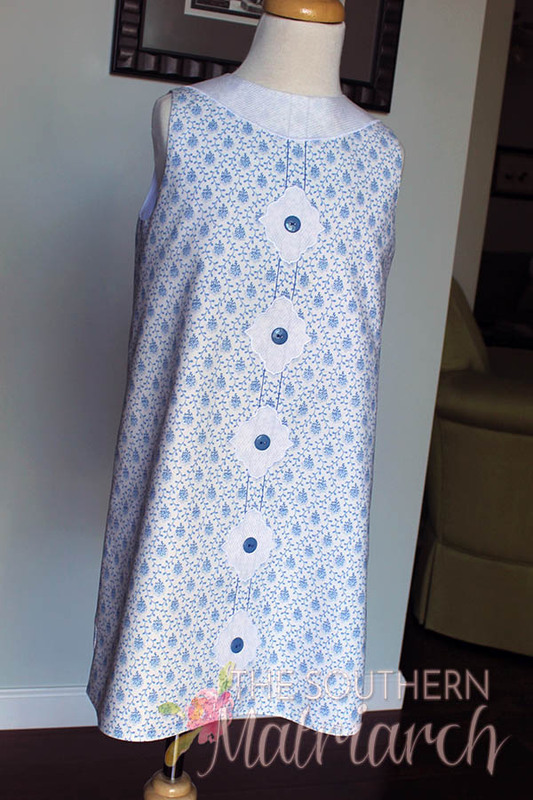 Lezette Thomason, former owner of Children's Corner Patterns, presented a challenge on the FB Sew Classic for Children page. Take the Lillian pattern and rework it. So that is what I did. This was my inspiration that I saw on Pinterest. 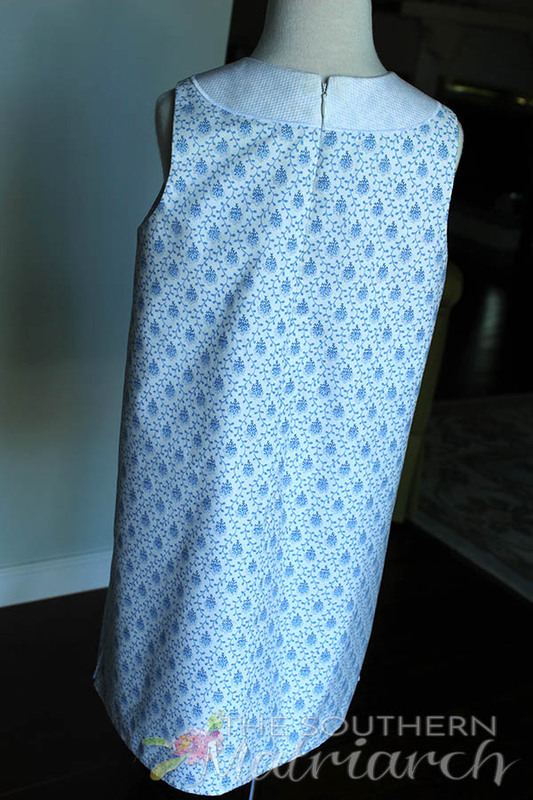 Fabric was a well aged piece of 100% cotton that Princess's mother brought back from Princess's first trip abroad. She was lucky enough to go to Paris at the wise age of five months. How fun is that selvage? 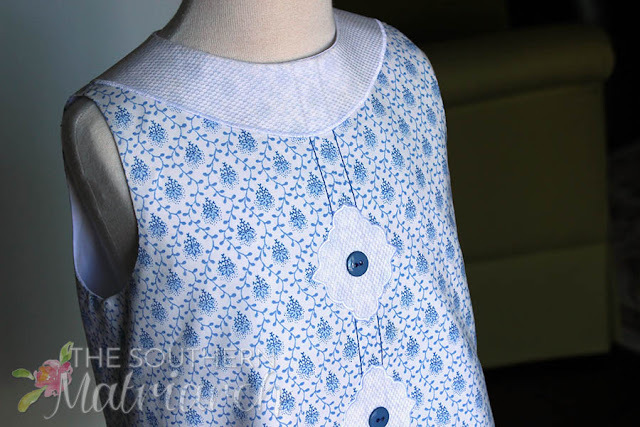 I mimicked the appliqués from the inspiration piece coupled with a faux collar, all of a large scale pique. The appliqués also repeat the shape in the fabric print. Because my fabric was a print I could have made it easier on myself with the center front. You can't really tell there is a center seam between the two rows of triple stitched top stitching down either side. And buttons, those were tough to match. Finally ended up with craft buttons from Joann. After using buttons all down the front, I felt like buttons down the back would just be button overload. A zipper was called for. A zipper!! A real sign that a little one is growing up. A moment of silence should be taken at this time. All in all a cool summer dress for Princess. Need to get some baseball shorts made for her brother before I send this. She doesn't like it if I send her something and not him. Keep stitching, faithful reader. What a darling interpretation of a pin-inspiration! Just love everything about it! Blue and white is always such a beautiful combination. Thank you so much for sharing this. Do hope it means you are feeling much better! It's adorable! I know zippers aren't quite kosher with heirloom sewing, but they do make it so easy to dress and undress wiggling kids. Love it!! So fresh and young lady-ish! I did sigh a little sigh for the zipper. Boy, do they grow up fast. This dress is so cute ! 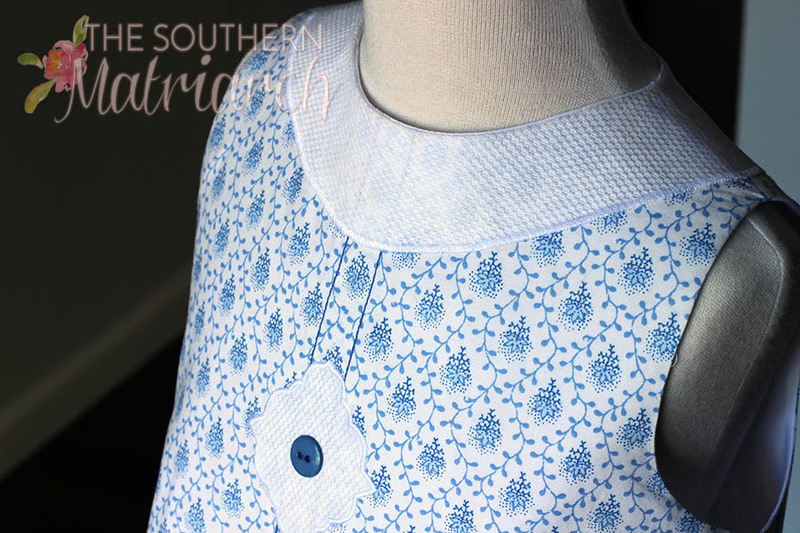 This southern France print is perfect for a jeune demoiselle ! Perfection!! I love her sweet heart too . . . get stitching for brother, now :). Love Lillian--such a versatile pattern for older girls I agree! Love the different front you did. It's an inspiration to me! Thank you!